This is my first German Shepherd and her name is Ila. We love her with all our hearts and have had her since 7 weeks old. She is now 7 months old. She is very good in obedience and can walk off leash. She can also do some tracking and is being trained to be a service dog for my brother. She is a definitely part of the family now. We have had our ups and downs but she's the best dog I think our family has ever had. She like most puppies used to chew up everything including leashes and laptop computer chargers. She is very healthy and I love her more everyday. She really understands me, I was sick and she just sat by me all day until I was better. 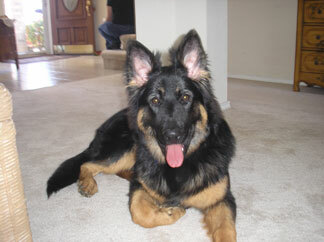 She's the best and now I'm in love with the German Shepherd breed.